EXIM Bank Managing Director and CEO Dr Mohammad Haider Ali Miah and DHL Country Manager Md Miarul Haque exchange documents after signing an agreement in the capital recently. 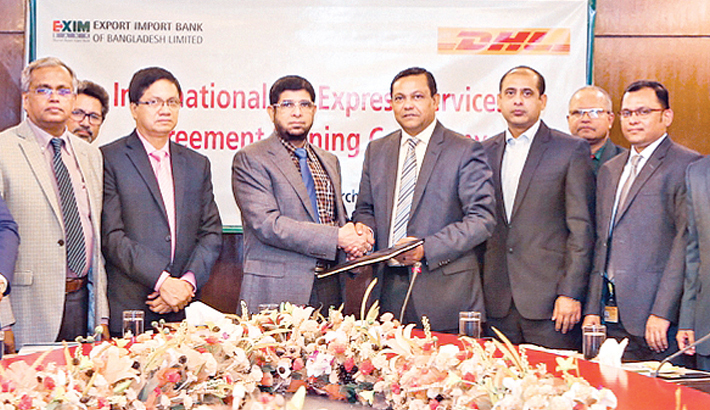 An agreement has been signed between Export Import Bank of Bangladesh Limited and DHL Worldwide Express (BD) Pvt. Ltd. at the head office of Exim Bank recently. Dr. Mohammad Haider Ali Miah, Managing Director and CEO of the Bank and Md. Miarul Haque, Country Manager of DHL, signed the agreement on behalf of their respective organizations, said a press release. Mohammad Feroz Hossain, Additional Managing Director of Exim Bank and other high officials from both sides were present.